This is a typical scene in one of our laneways in the older parts of the city although this one is a bit wider than usual since it backs on commercial buildings on the right. 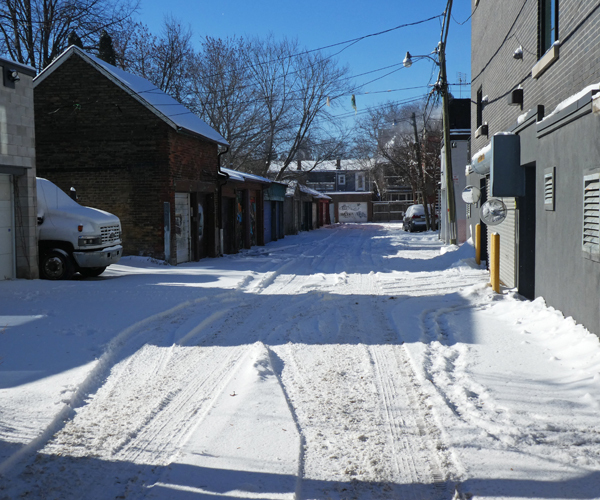 When we get snow the city doesn't clear the laneways so we all depend on the trails that get worn down by cars and if the snow gets really deep it becomes a neighbourhood cooperative with everyone shoveling behind their own garage. At least that is the theory since there will always be someone who does nothing. We finally got snow about a week ago. 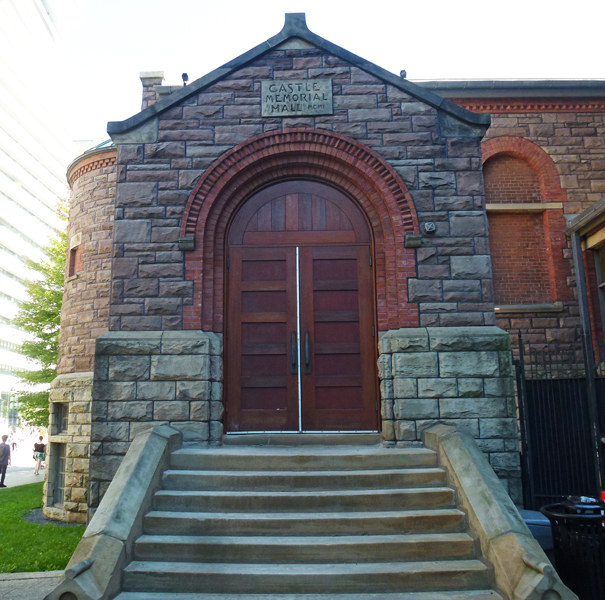 Castle Memorial Hall is located on Bloor St and is part of the Royal Conservatory of Music. It was built in 1901 and at that time contained a chapel and a library but through the years has had various different uses. In 1996 it underwent an extensive restoration and now houses a concert hall that is used for smaller events than the large hall at the conservatory. It was also renamed the Mazzoleni Concert Hall after a former principal of the conservatory. 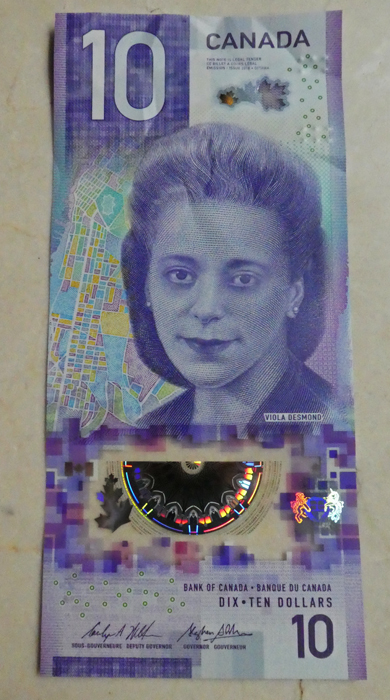 Our new $10 bill features a pic of Viola Desmond who becomes the first Canadian woman to be featured on one of our currency bills. Viola Desmond was a black woman who was jailed, convicted and fined for refusing to leave the whites-only area of a movie theatre in 1946. You can read a good version of her story HERE. I think this is also the first time we have had any of our currency run on the vertical rather than the horizontal. 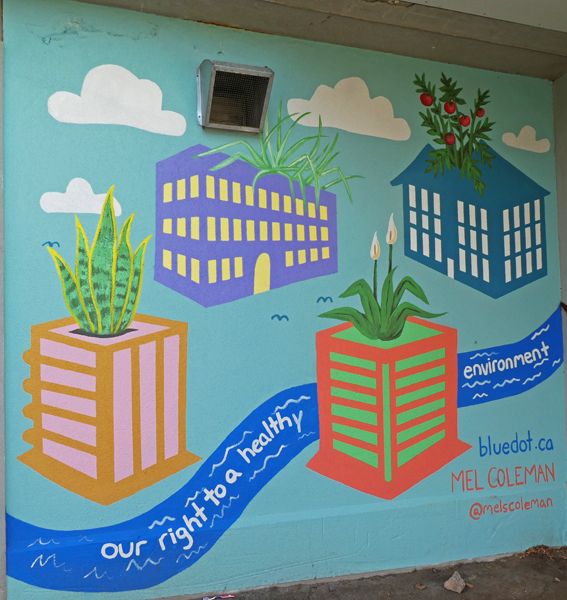 I spotted this mural on the side of one of the walls of the pool complex at Christie Pits Park. The artist for this one is Mel Coleman and it seems to be sponsored by part of the David Suzuki Foundation. It is a message for all of us - think green. This is St Alban's chapel which is found in the Annex. I showed you a pic of the interior back in July last year on a much warmer day (HERE). These cold winter days do give you a chance to get clear skies and no leaves blocking the view but it is cold holding a camera! 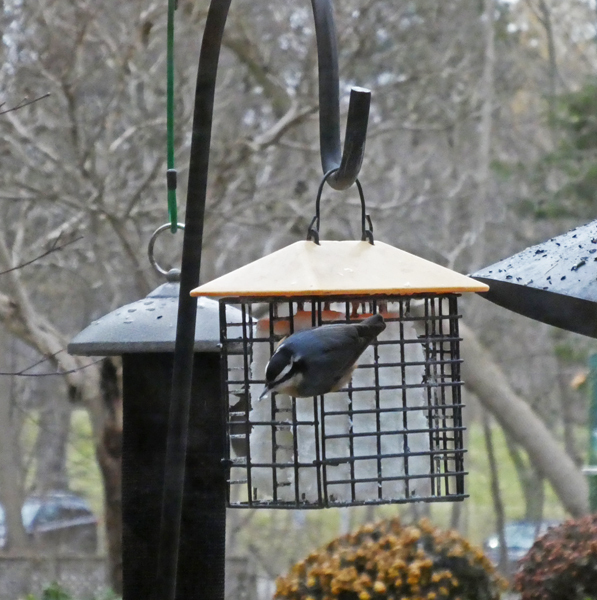 This Red-Breasted Nuthatch seemed to really be enjoying a few nibbles of suet. They never stay still for long but this one kept coming back for another mouthful. The woman in yesterday's post was headed for this neighbourhood rink which hosts many hockey leagues as well as recreational family skating times. At one time it was very difficult for women to find ice time in the city but a concerted effort has been made to change that and this rink in particular has women's leagues that cover several age groups. People play until the very early morning hours since those are often the only times available. The pic was taken through two layers of glass so isn't really sharp. This is a common sight on our streets in the winter time - someone walking down the street with a hockey stick and a huge bag of equipment. You see people of all ages and both genders and in this case it was a young woman heading to a local ice rink for a game. 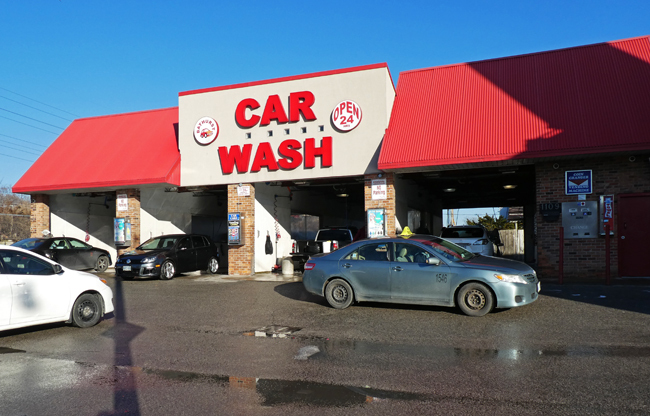 At this time of year if the temperature goes above freezing and the sun comes out it is time to head to a car wash. The lineups can be lengthy but it always seems that a car runs better when it is clean! 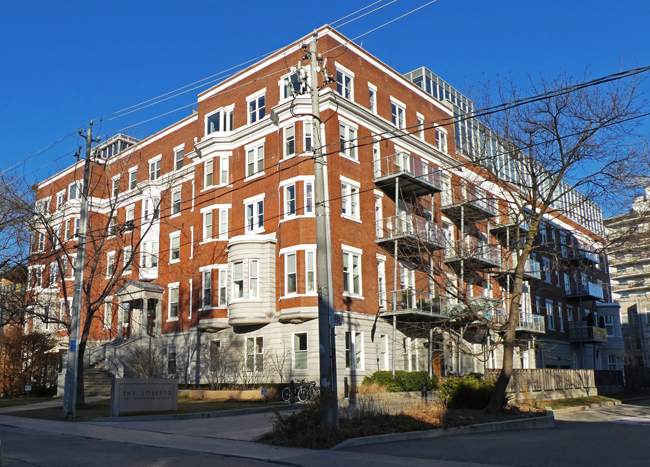 The Loretto is a condo building located in the Annex in what was the Loretto Brunswick Catholic school for girls. 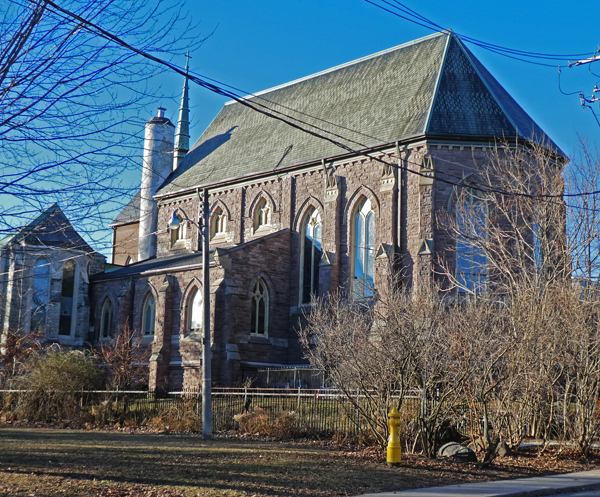 The building was completed in 1915 and was a convent and school until being sold and converted to condos in 2007. With heritage designation the front of the building had to remain intact but the other sides were allowed to have balconies installed. I've been in a couple of the units and they are lovely large spaces with high ceilings. It is certainly the season for ice fishing although it is not an activity for me. 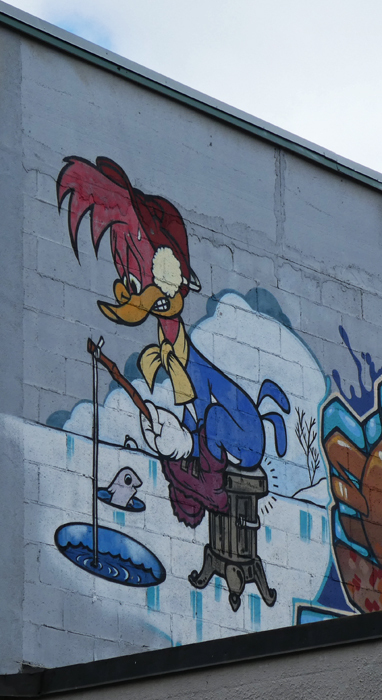 I spotted poor cold Woody high above a rooftop along Dundas St W and was glad to see he was sitting on a woodstove! 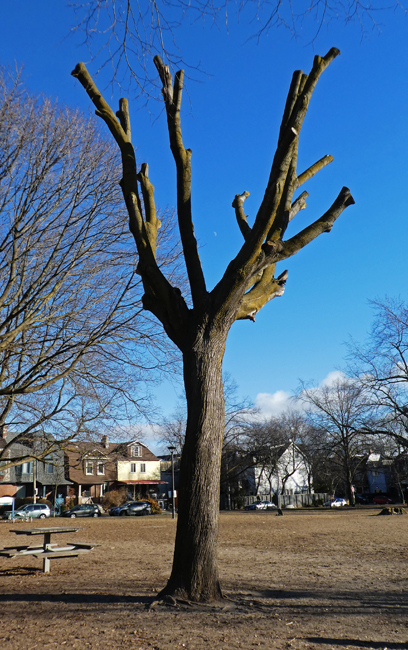 I spotted this sad tree in a local park last weekend when I ventured out on a cold windy day that was at least sunny. The tree had been dying and the first stage of removal was to cut off all of the small branches and then these larger ones and the trunk will be removed another day. 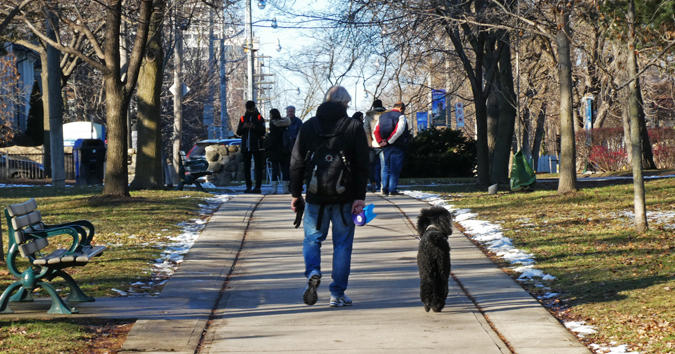 You don't see too many Standard Poodles around these days - there seems to be a huge population of Labradoodles here. I've have had two good Standard Poodle friends and they are such fun dogs as well as being so elegant. This one had just walked up the 110 steps leading to Casa Loma like there was no effort involved at all. I can never resist taking a pic of this building at the Spadina Circle just north of College St. 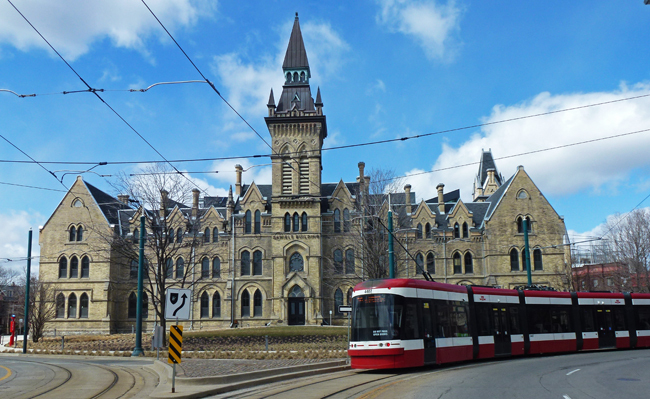 Built in 1875 the Gothic Revival beauty has had many uses through the years but now belongs to U of Toronto and after a recent addition to the other side from this pic it now houses the Daniels Faculty Of Architecture at the university. I was happy to catch the streetcar as it circled around the building. I have shown you a few of the small apartment buildings along Lawrence Ave E in the Lawrence Park neighbourhood before and thought I would show this one with its Tudor styling. It is hard to tell how many units are in it but there are two entrances, one on each side of that projecting section. There may be only 4 units which must each be a nice size. 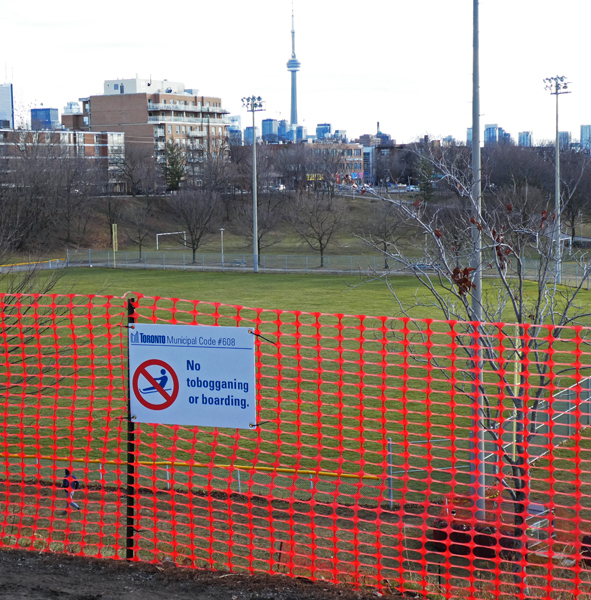 Christie Pits Park is one of the best places in the city for tobogganing and this hill is probably the steepest one in the park. Unfortunately there are a couple of large light poles at the bottom of it so it was necessary to make sure you steered around them. Well, the decision has been made to make this hill off limits and so signs and fences have gone up. We haven't had enough snow yet for a sled anyway. 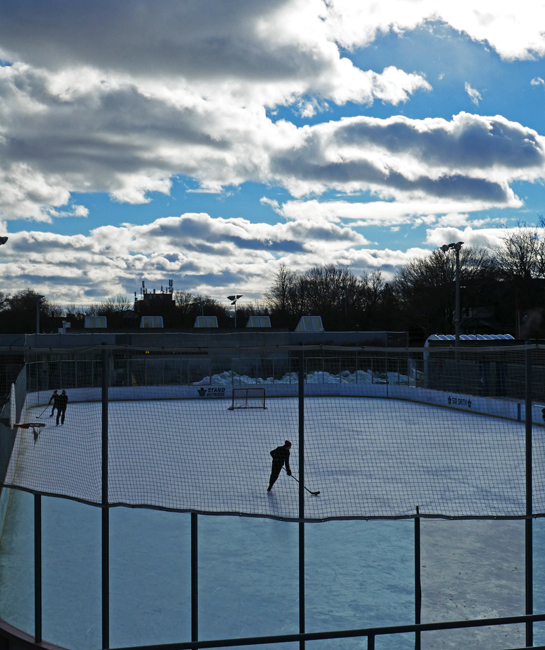 This pic was taken during the Christmas holidays at the rink at Christie Pits Park. Most of the skating rinks here have special hours for hockey and then other hours for pleasure skating. The hockey players had finished their time but the last few players were a bit reluctant to leave but finally did and then a large crowd of little kiddies with their new Christmas skates on took to the ice! 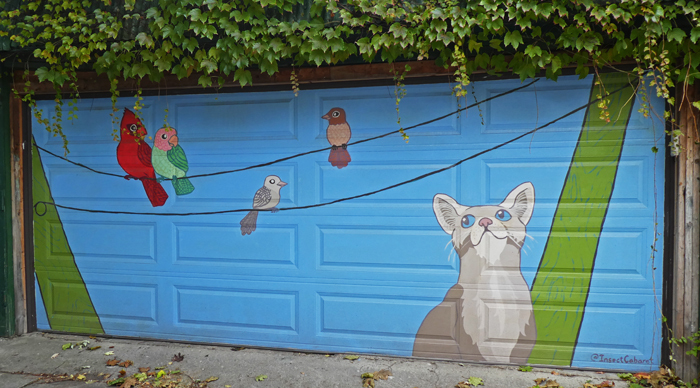 I took this pic of this garage door at the end of October when we still had leaves and the ivy makes a lovely frame for the mural. 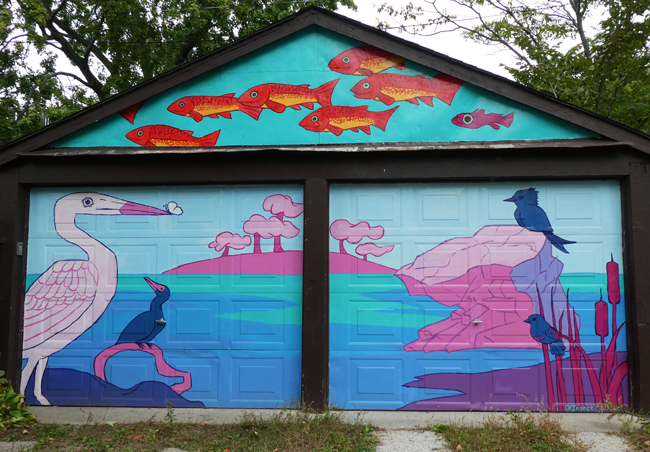 This is another mural by Insect Cabaret, the same artists as last week's post. It is hard to tell what species some of the birds are but we don't have Peach-faced Lovebirds in Toronto hanging out with Cardinals! We can all use a bit of colour at this time of year and so it is nice to find a sculpture like this one by Patrick Amiot. He is a Canadian who now lives in California and makes his pieces from junk metal and then they are painted by his wife Brigitte Laurent. I would love to own this one! I took this pic at the Sunnybrook Health Sciences Centre in the Veterans Centre garden. They have installed these funnels on all of the poles holding the bird feeders to try to stop the squirrels from eating all of the bird seed. As you can see, it doesn't always work. This squirrel jumped up onto the bird bath that you can see a bit of in the left background and then leaped over to the pole above the funnel and then could reach the bird feeder while hanging onto the pole with a back foot. 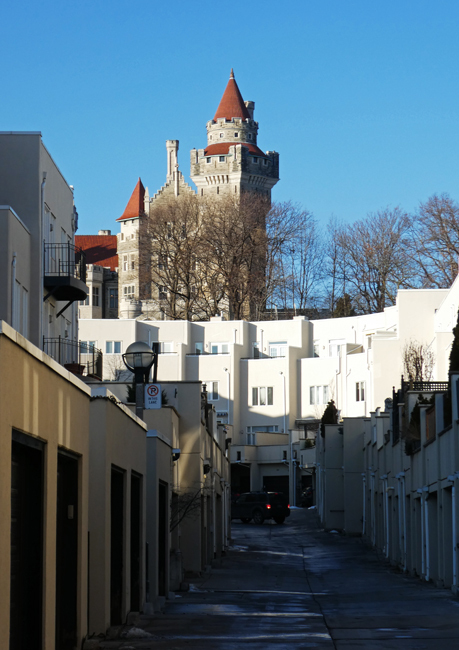 As I wandered past this laneway that leads to the garages of the townhouses across Davenport Rd from Casa Loma I was reminded of parts of European cities. And with the leaves gone from the trees we get to see a bit more of the Casa. The day I took this pic last week was actually a nice day and everyone was out enjoying a sunny sky and temperatures around 7˚C. 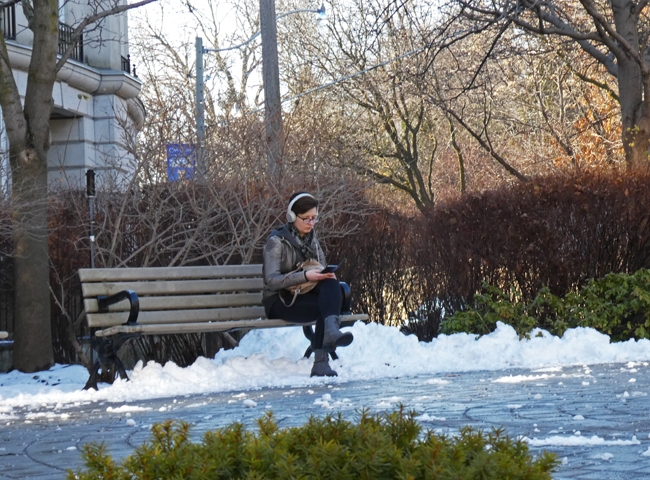 It still seemed funny to see this young woman sitting on a bench surrounded by snow and totally engrossed in her phone. 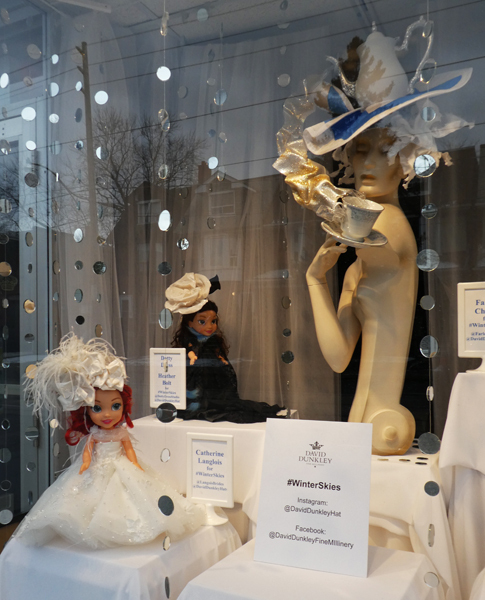 I spotted this display in the window of a hat shop and thought they had a good idea to show the fascinators on little dolls. That is one large hat that even includes a teapot on the large figure. 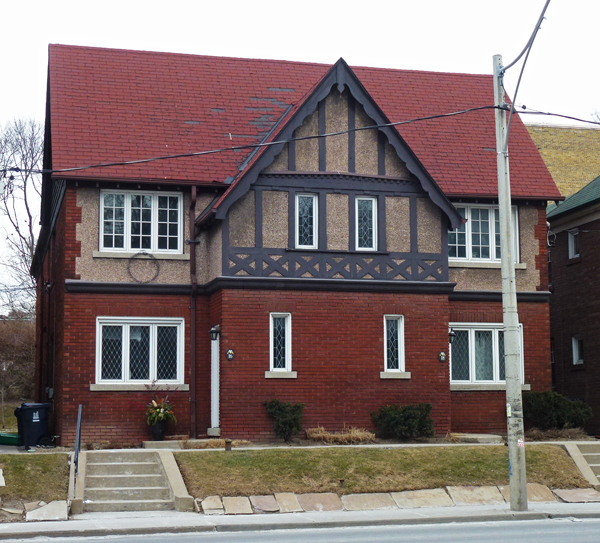 Houses are big in the Annex neighbourhood even when they are semi-detached as this one is. The dividing line between these two runs up between those doorway arches and even cuts through the little gable at top. Most of the year this home is partly hidden by leaves so that is one nice thing about winter in that it reveals lovely things such as this house. 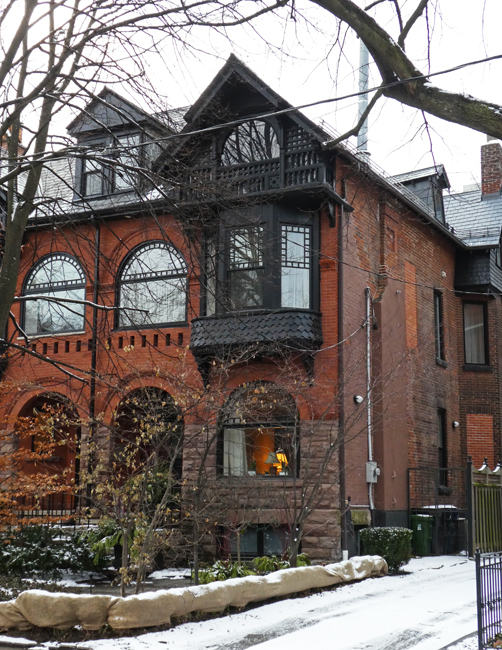 This is a very pricey street with neighbours like Margaret Atwood who lives just a few houses down the road. At this time of year when there is very little colour around outside this must be a perfect garage door to come home to at the end of day. I took this back in September when we still had leaves on the trees so the colours would stand out more today. This is another one by Insect Cabaret whose work I have shown before - just click the label below. 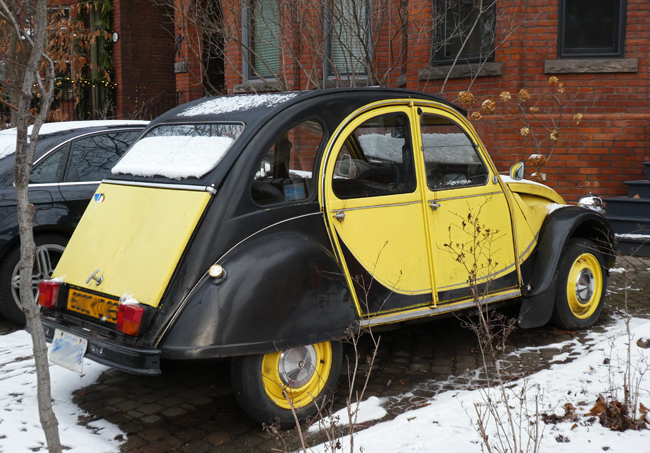 You don't see too many of these old Citroen Deux Chevaux around Toronto so this one stopped me in my tracks as I took a walk in the bit of snow we had last weekend. It looks in great shape so it probably isn't driven when the streets are salted in the winter. I have no idea what year it is but they were made from 1948 to 1990. 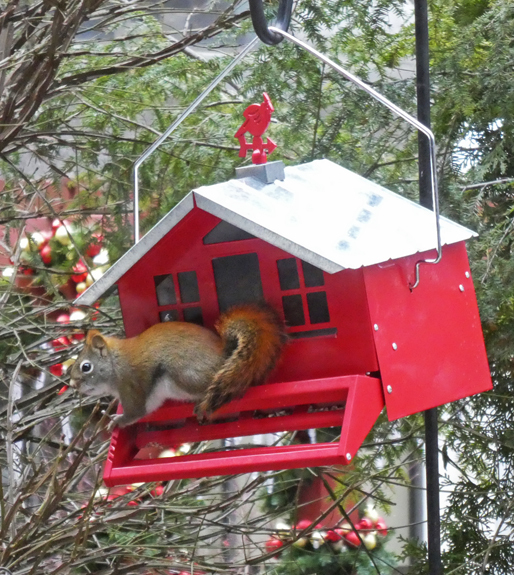 This is a bird feeder that is meant to be squirrel proof and works by closing up the entrance to the seeds when a squirrel puts its weight on that bottom bar. This very smart red squirrel has figured out that if he stays up on the top bar he can reach down and get seeds without the entrance closing. He is small enough to do it that way. 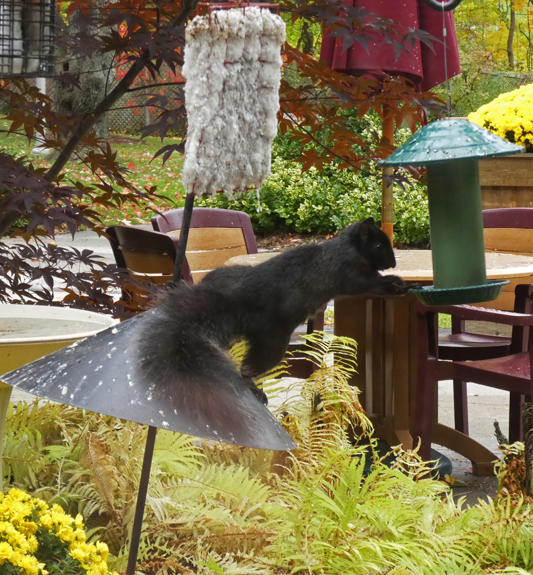 Some of the black squirrels who are larger have found if they hang onto the chimney with a back foot they can reach down and get seeds without stepping on the bar but they can only hang on for a short time and then they fall. It is great fun to watch. Soldiers' Tower is attached to Hart House at U of Toronto and was constructed in 1924 to honour alumni who had lost their lives in WWI. It was redesigned in 1949 to include the names of those who gave up their lives in WWII and then renovated in the 1970s when more bells were added to the carillon bringing the total up to 51. It feels like ages since we had such a clear sky and in fact I took this pic in mid October. This is the entrance to the Randolph College For The Performing Arts which is a private college that occupies part of the Randolph Theatre. 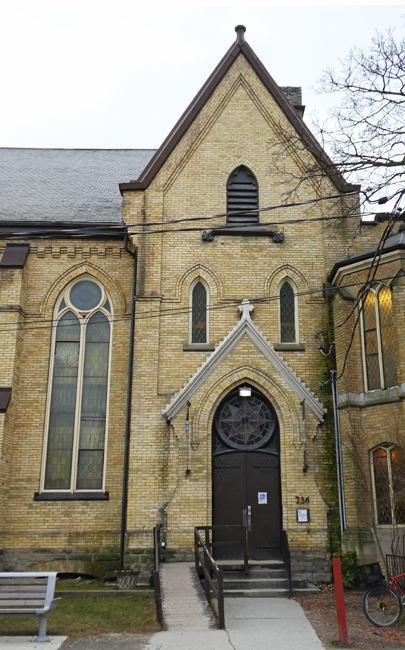 The theatre is located in the former Bathurst Street United Church which was built in 1888. I would love to see that window above the door illuminated at night. Mabel's Fables is a wonderful children's bookstore that has been on Mount Pleasant Ave for many years. Mabel is the resident cat and I think they are now on Mabel ll. It is one of those places where you could wander and browse for hours. 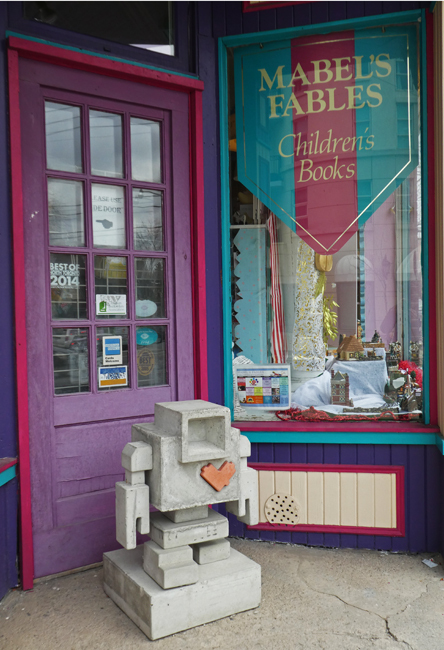 I was thrilled to see the Lovbot standing out front to greet eveyone! The January theme day for the City Daily Photo Blog community is "photo of the year" and I chose this pic from May just because I like it and it seems to have a story going on. Is he waiting for someone? Have they already left? Or .....? 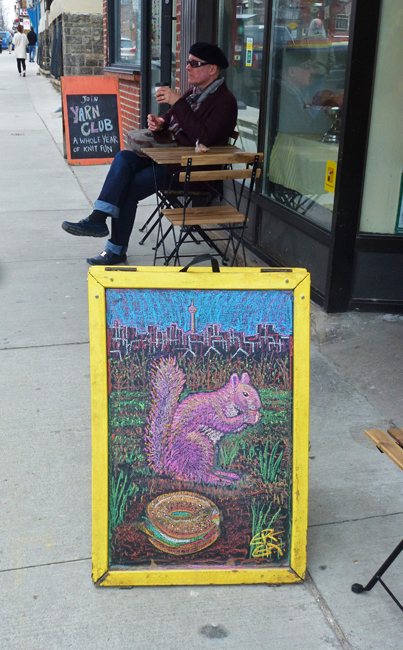 I also like the squirrel sign and squirrels do appear fairly often on this blog. Taking part in the January theme. Click HERE to see more "Photos of the year" from around the world.